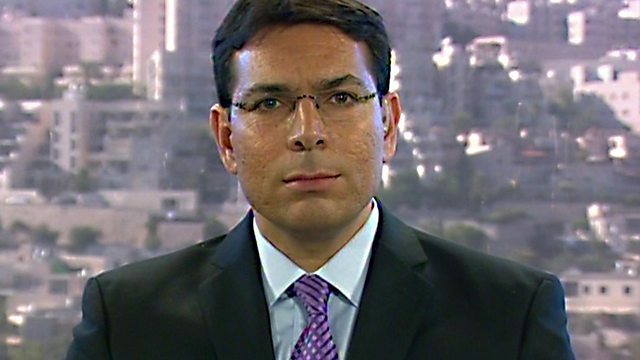 HARDtalk speaks to Danny Danon, who was dismissed as Deputy-Defence Minister for Israel this month. After weeks of conflict, how does he justify the high Palestinian death toll? Israel says its current campaign in Gaza is in response to rocket strikes from Hamas militants and is aimed at destroying illicit tunnels Hamas uses to smuggle arms. In more than two weeks of conflict around six hundred Palestinians - mostly civilians - have been killed and nearly four thousand wounded. The UN Human Rights Commissioner says Israel may have committed war crimes. About thirty Israelis have died - nearly all of them soldiers. HARDtalk speaks to Danny Danon a member of the Israeli prime-minister Benjamin Netanyahu's Likud Party. He was dismissed as Deputy-Defence Minister earlier this month for accusing the Prime Minister of being too weak in his Gaza campaign. How does he justify the high Palestinian death toll?